Next year if eyes and hand allow I'll try again if only to relearn the artist's first lesson, so well and so long ago laid down in Plato's theory of forms. 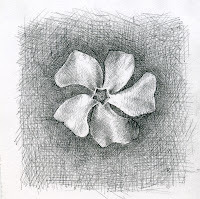 The classic periwinkle flower is an amazing construction. Designed (if one may still use that word without prejudice) like a ship's propellor: it is full of energy yet with only wilting and withering in prospect, full of movement but with nowhere to go. 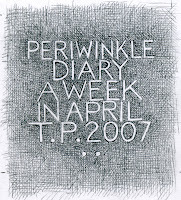 Friday/Diary title, 5" x 5" 2007.